to wish all of you a Happy New Year! Being where we are, we enter 2012 before most of the rest of the world, so we get the jump on this. Many people use this holiday to make resolutions and plans for the new year. We’ve never done that, so probably won’t start now. Instead, we think it is a good time to reflect on the past year. Did we do much…? No, not really. This was our itinerary last year at this time, from Valparaiso around Cape Horn and up to Buenos Aires! Argentina, penguins, flights, winter, snow, visa applications, AQIS apps for the cats, snow, lots of domestic travel, snow…that takes us to about the end of February. Did we mention that it was snowy in Edmonton? And cold? This, we remember! Then the pseudo-departure. Most of June was spent in the UK, back to Edmonton for a few days and then the real departure, with a one-way ticket from YEG/YVR to SYD and on to our new home…We figure that in the first 200 days of 2011 we probably each logged around 35000 miles of travel – Lisa probably a bit more, Dan maybe a bit less. And if you take into account December 2010, we’re probably pushing more like 60000 for the year. And finally, Wagga Wagga, the city so nice they named it twice. Whirlwind weeks of finding a house, buying a car, establishing a new life. Lisa starts her new job, we lived without furniture and cats. We got our cats, we got our furniture, Dan gets a job….we get a normal life. Eventually we start to explore the region – dog competitions, pie eating competitions, farm sculpture, cherry picking, cycling, wineries, making new friends… Locals tell us we probably know more about the Riverina area than people who have lived here for years. Lots of high points. We live among kangaroos, the occasional wallaby, daily sightings of parrots, rosellas, galahs, cockatoos, fairy wrens, egrets, darters, herons… and bogans. And a lot of new insects, the occasional red back spider and the spectre of brown snakes to keep us on our toes (the count so far? Dead snakes = 2; Live snakes = 0). Our backyard, and neighbourhood, is abundant with flowering things that we have no idea what they are. Life is good. 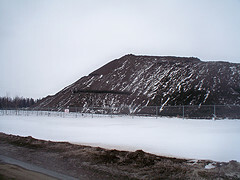 Unlike Wagga, where it's 30+ this week, Edmonton will be creating another snow pile. This is last year's snow pile... so big that CTV Edmonton launched a contest to see when it would melt (the winner would have this year's pile named after them... we feel sad for them!). And now we have a warm Christmas season that isn’t part of a vacation – Chrissie lunch at a winery on the edge of Wagga, and as this post goes live at midnight, January 1, 2012, we are on a decadent 4 day, 3 night weekend in one of the country’s best wine regions (full report is coming soon!). We considered doing the uber-touristy visit to Sydney for the fireworks (something many Canadians experience on TV every year, since we’re still awake and sober enough at that time of day on December 31st to appreciate the pics) – but the idea of being surrounded by millions of drunk people while we waited for fireworks at the Harbor didn’t appeal to us. After all, a quick Google image search provides lots of pics of these iconic images, without the jostling of crowds or the vomit (well, we’re not sure what you’re doing as you read this… but we’re safe). Hmmm, not a very eventful year, eh? Maybe we should make a resolution to try to actually accomplish something in 2012 (Lisa edit: speak for yourself, Dan-o! As I filled out ALL of the paperwork for the big move, I feel like I accomplished a lot. Guess you’ll just need to work harder next year… like doing our Permanent Residency applications all by yourself? Oh wait… those are almost done, again, by ME! Guess you’ll have to work a lot harder… or start searching out day spas where I can relax a bit). Perhaps you, dear readers, will join us in our adventures? Remember (for those of you in the northern hemisphere, at least), with an extra day to plan it’s not too late to add Wagga to your “to-visit” list for 2012. And, oh yeah, please vote for us in the Canadian blog awards cdnba.wordpress.com. We’re thrilled to be up for the 2011 Best New Blog! This entry was posted in birds, Canada, Christmas, cruise, Edmonton, Moving, New Year's Eve, southern hemisphere. Bookmark the permalink.